Zach Fink has discovered a worthwhile way to help fight Lyme Disease, a disease that has significantly impacted his life and one be believes is a threat to many other lacrosse players. Fink, a junior lacrosse standout at Harriton, has been dealing with Lyme Disease for two years. The disease has caused him excessive fatigue, and has affected his schoolwork and athletics. Because his grandmother and younger brother also have endured advanced Lyme Disease, Fink has become an advocate for Lyme awareness. He says the disease is somewhat of a mystery because many victims don’t know they have it and most have varying symptoms. Fink has created a business to help educate others and also raise money funds to support research and cures to treat the epidemic of Lyme disease and other tick-borne illnesses in the region. He and his family recently launched “Fink’s Powerful Pancakes” at www.powerfulpancakes.com. Fifty percent of the proceeds from the business go to the fight against Lyme Disease. The dry pancake mix, available online at $3.95 a package (8 ounces makes 18-24 pancakes), are made with no preservatives and mostly from organic ingredients with some whole grains. The recipe, created by Fink’s mother, is a hit with Fink’s friends. Powerful Pancakes provide 16-20% of the daily recommended doses for fiber, and have high levels of calcium, iron and Vitamin A. The pancake mix is licensed with the Department of Agriculture. Fink was diagnosed with Lyme Disease and Babesia during the spring of 2009 after many months of exhaustion that caused an inability to sleep, severe fatigue, breathing issues and a number of other odd symptoms. He took antibiotics and anti-malaria drugs for over 8 months before his symptoms cleared and he did not fully recover until last spring. Both Lyme Disease and Babesia are transmitted though tick bites. Lyme is a bacterial infection which is treated with antibiotics but Babesia is a protozoan infection of the red blood cell in the malaria family which requires anti-malaria drugs. Why is Lyme Disease a big issue for lacrosse players? Fink believes that because lacrosse players play on grass fields, walk through wooded areas to get to fields and often chase balls in wooded area where ticks collect, they are often exposed. Pennsylvania and New Jersey are two of the top five states in the nation reporting the most Lyme Disease cases each year. The best defense against this disease is awareness of the disease and the symptoms. These steps should be taken: include regular body checks for ticks – especially in the hair, groin, underarms and back – and knowing that flu symptoms from May to October and all rashes should always be suspected Lyme Disease when evaluating the cause of illness among athletes and their families. This “awareness” is the focus of Zach Fink’s mission through Powerful Pancakes. “We want everyone to know there are athletes out there like me that are tired for no reason,” said Fink, an All-Central League Honorable mention performer in 2010 and an Honors student (4.1 GPA). “I found out when I had trouble sleeping at night. “I didn’t have any immediate bulls-eye rash; just fatigue. I would go on the field and get tired quickly and I didn’t know why. I was in the best shape of my life and I felt I should be able to run mile after mile. Fink’s family has been hit hard by Lyme disease. His grandmother has endured many serious symptoms from long-term neurological problems caused by Lyme– problems with vision, hearing and walking – caused by Lyme for 10 years. His brother, Luke, has had Lyme for two years and also has suffered from neurological problems – causing anger, loss of speech and other related symptoms. Fortunately, his health issues have improved in recent months and he is close to being back to normal. Fink said that the biggest problem with this disease is that there is no consensus on how to identify it, how to treat it properly, whether it can be chronic or not, or whether it is under treated and under diagnosed because the disease can imitate so many other health problems. To provide the most valuable sources of information, Fink’s website has a list of valuable resources on the web. One organization, the LDASEPA (Lyme Disease Association of Southeastern Pennsylvania at www. LymePA.org) will be the major beneficiary of the funds raised. The Finks hope to work with that organization to improve the identification of Lyme disease and better treatment of the disease and co-infections. To help in awareness, Fink is giving his teammates at Harriton a “Tips for Preventing Lyme Disease information sheet” this spring. 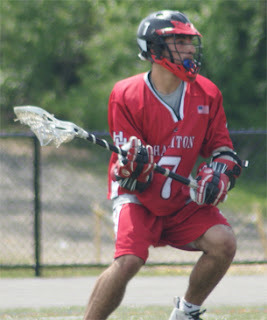 He is also hoping to distribute information to most of the local Main Line and Pennsylvania high school lacrosse teams and at major lacrosse events throughout the year.